Sweet Spot Nutrition > What to Eat > Does juice belong in your heart-healthy kitchen? 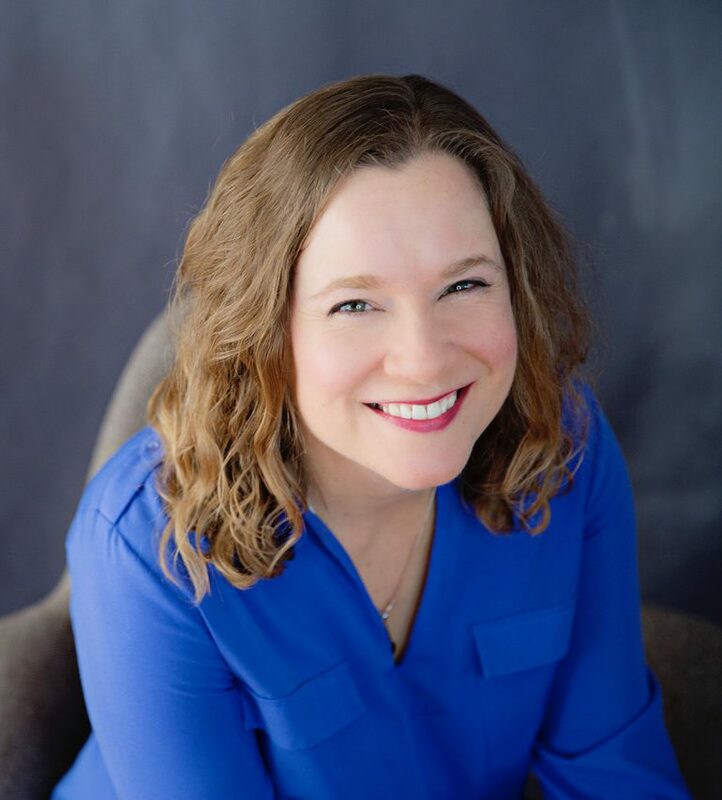 I had the pleasure of doing my “Eating for Energy” workshop this week at a corporate health fair, but ran out of time to answer one of the questions that had been posed at the start: “What are my thoughts on 100% unsweetened fruit juice?” Since I wrote up the answer to email to them as a follow-up, I thought I’d expand on and share it here. Notice how that helpful package says “never sweetened”. Never sweetened because it’s already brimming with natural sugar. In liquids, sugar is consumed, digested, and absorbed much more quickly than in solids. A medium-sized orange would have just ~12g of sugar (plus fibre!). Could you eat four of them the way one might polish off this juice? Even if so, you’d likely be much more satiated. Typically, vegetable juice is much lower in sugar. This one is low-sodium, but some are flavoured with (lots of) salt. This is low-sodium V8. The regular in this size (2/3 cup) has 325mg of sodium. 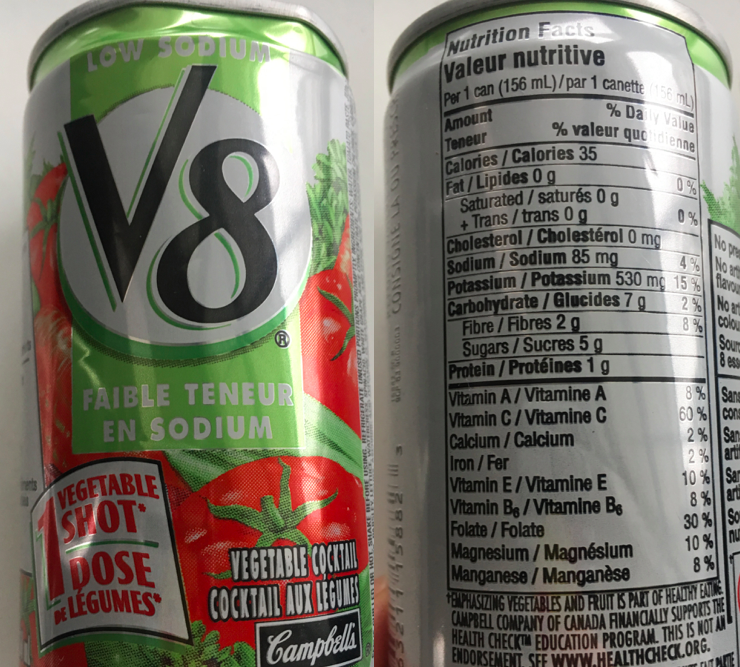 If you’re used to regular tomato and V8 juice, you might find the low-sodium versions bland, but as with many lower-sodium foods, you adapt and after a while it tastes fine. Other vegetable juice products may include apple or grape juice as cheap, innocuous-sounding sweeteners, so read your labels. There’s no reason to think that a $10 bottle of locally crafted, organic juice is any different. Some are made with more vegetables, so they’re lower in sugar, but read the label. 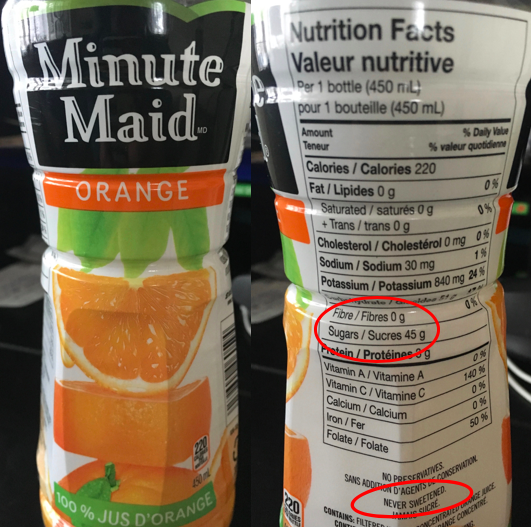 Note these nutrition facts are for half the bottle. So these bottles contain 38g and 18g of free sugar, but they’re organic at least (haha). Superfood is a marketing term. Yes, certain juices give you more antioxidants than others. But they’re still a significant source of liquid sugar. Take this POM juice for example. Each bottle contains two of these 31g of sugar servings, so if you down the whole delicious thing, it’s 62g of sugar, more than a days worth. 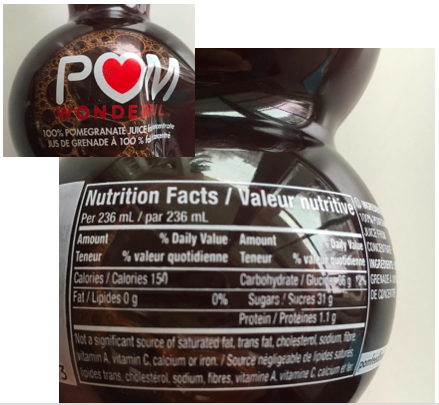 And, fun fact, the US Federal Trade Commission filed a complaint in 2010 that POM Wonderful had used deceptive advertising when marketing the antioxidant-rich drink as being able to treat, prevent or reduce the risk of heart disease and other conditions. Not so super after all. Hopefully you know by now that I’m not an all or nothing girl. If you’re on vacation in the tropics and someone offers you a mango juice, by all means, enjoy! Swanky brunch has pineapple smoothies? Yes please. The point is not to have it as part of your regular routine. 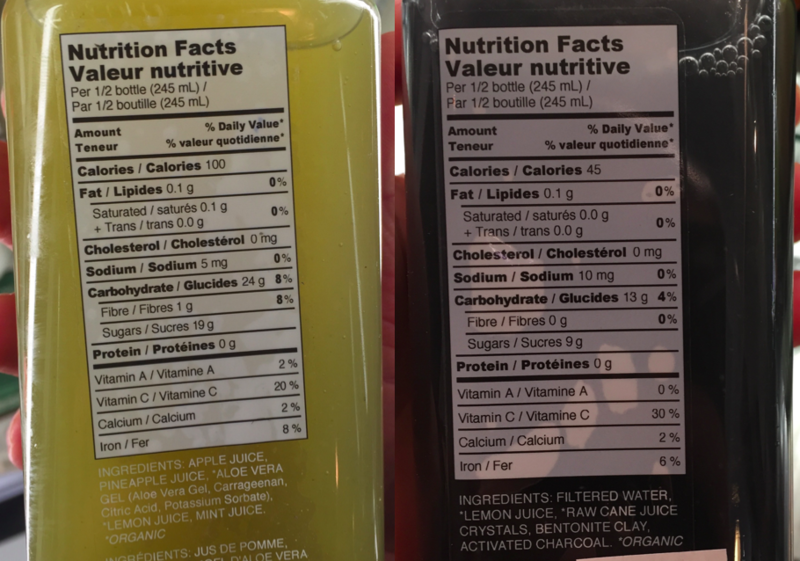 If you can’t possibly imagine giving up your morning juice ritual, there’s always the option to have just the 4oz (125mL) recommended in the Canada’s Food Guide, although it’s likely the new guide will no longer encourage that equivalence. But if that portion size was commonplace, we probably wouldn’t be talking about this. 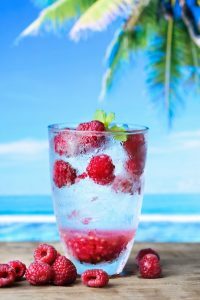 So while fruit juice is hydrating, which is a factor for feeling energized, lower sugar beverages are too. Water, sparkling water, milk, soy milk, coffee, tea, even water infused with fruit… there are lots of options.